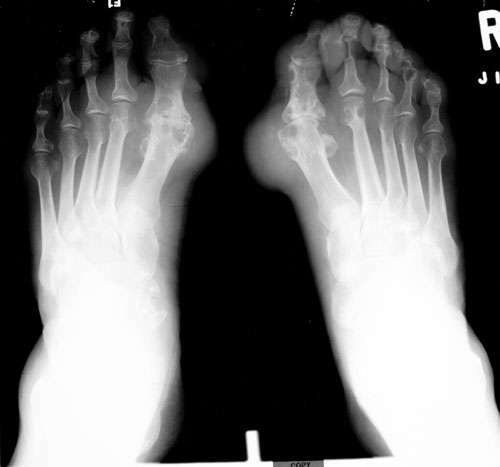 Charcot arthropathy, also known as neuropathic arthropathy, is most commonly caused in the United States by diabetes. It commonly affects the foot, and especially the midfoot region. Radiographically, Charcot arthropathy is characterized by fragmentation, sclerosis, swelling, and destruction of the affected joints. It is difficult radiographically to separate from infection and osteomyelitis, which are also common in diabetics. Note on this lateral radiograph of the foot the fragmentation and destruction at the talonavicular joint. Calcified debris is seen projecting over the soft tissues adjacent and superior to the talonavicular joint.